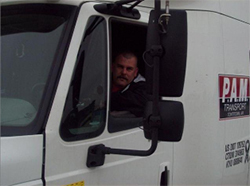 Today, we bring you Part 2 of our interview with PAM Transport driver, Charles Pina. To check out Part 1 of our interview, just go here. And remember to check back for Part 3 tomorrow. Q: How much home time do you get and how do you use it? A: Being on dedicated, I am home at least one day a week. Once I pick up in Tennessee on Thursday, then I will head home after that. I then pack things up and leave out again on Sunday. I basically plan everything for the weekends. If I have doctor appointment, I let the dispatcher know and he makes sure I get home for it. I always put in for things at least 2 days in advance and schedule all appointments for Friday. Saturday is my day to spend time with the family and then I head back out again on Sunday. If I need to be home for something else, I just let my dispatcher know and he makes sure I am home. Q: How did the recent downturn in the economy affect you, or did it? A: During the economic recession, some of the companies we were hauling for scaled back a bit. I tried to schedule around it as much as possible and even did some over-the-road (OTR) routes. Things are picking back up now and I can tell it's getting better. We’re picking up more runs for some of those same companies - that has been a good thing. PAM Transport is always asking for more trainers and those with HazMat endorsements because they are picking up those loads a lot now. I’ve talked with a few new drivers, but don’t want to move into a trainer position because I like my current dedicated route. Q: How does PAM Transport keep you updated on CSA information? A: They (PAM Transport) send bulletins on Qualcomm for us drivers to check. They let us know about things like the recent Hours of Service change. PAM Transport also encourages us to make sure we’re checking our trailers and doing better pre-trip inspections. As far as checking brake adjustments – the mechanics handle all of that stuff. If we find something wrong with our trailers, we arrange to have a mechanic fix it. PAM Transport has been pretty good about getting me a mechanic when it’s needed. In fact, that’s where I am headed right now. Some things we will have to go into shop for, but most things they send us to a Petro.